Growing up as a child, the friendly old man who talked about bugs and trees on the TV series “The Nature of Things” and countless other documentaries seemed like a hero of gigantic proportions. 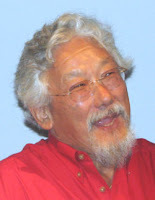 That’s why it was so surprising to see Canadian Environmentalist Dr.David Suzuki enter Norfolk United Church in Guelph on February 14, 2006 as an average-sized man. It was his sixteenth stop across the country amidst his month-long “If YOU were Prime Minister…” tour. “There’s the man!” was how Bill Barrett of Planet Bean, a local vendor dealing in fairly traded, roasted coffee introduced him then made reference to the fact that here was David Suzuki speaking to about five hundred of us on Valentine’s Day, rather than seducing his wife over chocolates and expensive wine. “Welcome to the largest single club,” he joked. While Suzuki’s tour focused mostly on the issue of global warming, Barrett did a good job of highlighting the historical relevance of environmental concern in Guelph specifically by going back in time one hundred years ago, when the city I now live in was facing a water crisis. The local hospitals were filled with typhus patients, also known as “jail fever” because the disease is often encountered in areas of poor hygiene. Reasonably enough, when better water sanitation was introduced, the problem was solved. Right now we are on the brink of another water crisis worldwide, stemming from the climate change crisis, which Suzuki never imagined would progress this fast. While the equator may see small temperature increases of a degree or two, that translates to about twelve times that increase at the South and North poles. It has also been evident by the rapid disappearance of glacier-capped mountain peaks like Kilimanjaro in Tanzania, Africa which feeds into rivers that supply 40% of the world with their drinking water! If this water source disappears by 2015 as scientists predict, we will be facing a major water crisis for a huge portion of the world’s population. So he wanted to emphasize that action makes a difference. We’ve got a long way to go in order to make ourselves heard and make environmental protection a part of the democratic process. Suzuki was about to make some very good suggestions about how we do that. Guelph has many organizations and businesses devoted to the environment; everything from the rain barrel collection program, Speed River clean-up, to the community garden and the low energy light bulb project. We have the Fair Trade Coffee Coop, the Youth Employment Action Program and a whole slew of other acronyms. Barrett painted the picture of perfect community cooperation, yet when he asked: “What’s missing?” and then: “Where’s our local MP?” Mayor Karen Farbridge was not available to respond. Many people got involved however, including alumni of Guelph’s Economics program, who asked questions following the lecture and suggested other Economists have to start regarding our natural resources as part of the equation. Also, local media group, Ed Video was taking five minute film snippets of what people would do were they to be elected Prime Minister. Let’s face the facts: there is a direct link between what we do to the environment and the overall health, sanity and productivity of our society. Today we have a tougher battle to fight as rates of asthma, obesity and cancer increase with the amount of hormones and pesticides in our rivers and the amount of greenhouse gases in the sky. Warmer weather has meant an increase in pests like the red beetle and the mosquito, which spread infections, plaguing our societies with disease. To sum our current state, I could quote singer/songwriter Jeff Buckley: “The sky is a landfill.” And who do we have but ourselves to blame? Suzuki’s father always thought he would be a preacher, so it did not seem out of the ordinary that Suzuki would be preaching to us from a pulpit in a church about how we can save our planet from eternal damnation. One of Suzuki’s critics said that his problem was that he was “preaching to the converted” and therefore not making much of a difference. However, although many of us believe in the environment and know it’s important to conserve, how many of us think of turning off the lights when we’re not using them, about taking shorter showers, riding bikes and buying local food? Suzuki suggested the future depends on whether the “converted” keep talking, being creative and, above all, being active. A positive point that Suzuki noted was that our attitudes have come full circle since 1988 when Lucien Bouchard suggested that the climate was the “most pressing issue” for political campaigns and that global warming “threatens the survival of our species. If we don’t do something now we’re in big trouble.” That was back in ’88 and since then we haven’t really done anything. Considering Stephen Harper is now saying it’s too late to reduce emissions and attempt to act in accordance with the Kyoto Protocol, environment is again the major issue for the upcoming election. As a sidenote: we haven’t heard anything from Environmental Minister Rona Ambrose since she suggested we’d have some “made in Canada” solution to the international climate crisis. It was nice to see ex President Al Gore gaining a “best documentary” Academy Award this past week for his movie “An Inconvenient Truth” which exhibits images of the glaciers completely crumbling and draws alarming connections between weather change and the environment. Fascinatingly, ice samples taken from the Antarctic can accurately show carbon levels for the past 650,000 years. Right now we have more carbon dioxide in the environment than that entire span. If the trends continue as they have been, Greenland could completely melt within the next decade, raising ocean levels enough to put most of Florida and parts of New York, including the historic World Trade Centre site, underwater. It is these kinds of leaders which can, through creativity and hard work help us register the true costs of our actions from yesterday and those that we commit today. So what are the costs? Why does it seem so impossible for politicians to mount a campaign against the annihilation of our biosphere? Sir Nicolas Stern, who was Chief Economist for the World Bank calculated that it would cost every country 1% of the GDP to correct the problem of global warming if they seriously got started now. However, the cost of not fixing it now will inevitably destroy the world economy completely. In other words: the cost is our lives. Suzuki struck out against how current politicians are manufacturing consent and trying to lure our attention away from the environment. An example of this is Stephen Harper’s 1% tax cut or our preoccupation with foreign wars which have led us to spend $16 billion on the military. Recently there was a smear campaign ad attacking Stephane Dion and the Liberal party in general with the tag-line: “let’s not go back”. Yet, if “back” refers to when politicians actually cared about our environment then perhaps we should. Liberals aren’t the only alternative choice. Volunteers from the Green Party were present at Suzuki’s event, handing out leaflets at the door. Speaking of increased military expenditures and tax cuts, in a country with one of the highest rates of consumption, why aren’t we conserving our budget and taxing people MORE for their consumption rather than less? Suzuki highlighted other countries that have taxed their citizens creatively, by charging them for how much garbage they throw out by weight, as they have done in Germany. If economics is the study of financial incentives then doesn’t it make sense (cents?) to reward good environmental behaviour and punish the bad? After WWII the consumption rate of the world has ballooned! Politicians however, often confuse spending with a good economy and argue the environment isn’t worth it because it costs too much to clean up. What they don’t understand is that the environment is all we have!! After 9-11 for example, President George Bush, yet the most devastating President to the environment since his father, encouraged citizens to “go out and shop”, as if the terrorist enemy was the fear of living decadently. The Earth Summit in Rio de Janiero in 1992 was planned to tackle this problem of global consumption. Agenda 21 was a blueprint for how we could live in a sustainable way. Admittedly, it was very complicated and confusing but yet everyone signed it, rich and poor countries alike! Two years later however and the rich countries like Canada basically said “Sorry, we can’t afford it.” If WE can’t afford it and WE are the ones responsible for most of the global environmental degradation, how do we expect developing countries like China, who are currently setting up open pit coal mines by the thousand, to learn from our mistakes? When Prime Minister Jean Chrétien ratified the Kyoto Protocol in 1992 it committed us to reducing our emissions. In 1995 the Kyoto Protocol became international law. In 1997 Canada’s goal was to reduce their emissions 6% less than 1990’s levels. Since then we have INCREASED our levels of emissions and become a laughing-stock to the international community. This is really deplorable considering there is now a 30% thicker layer of carbon dioxide in our atmosphere compared to what there was just one hundred and fifty years ago. Are Humans such a ‘Superspecies’ that we will Cause our own Downfall? So the ruling is out. David Suzuki is convinced that “efficiency protects the environment and saves money.” It’s not a trade off. We may just live in the most pivotal moment in the history of our species. What Suzuki sees as setting humans apart from other animals (not that we don’t share the same earth) is that humans have the ability to envision a future. He asked Guelph residents what kind of city they foresee living in in 2035. To start to make that city, we have to start now. In the US, despite being only one of two countries that didn’t ratify the Kyoto Protocol (neither did Australia), many cities have committed to the international treaty individually and Environmentalists like David Suzuki and Al Gore continue to travel and speak in order to make a change in our awareness and ultimately action, person by person. With combined efforts, changing the climate back is possible. One Person, So Many Animals. What Can I Do? So what can you do as an individual person? What if politicians don’t listen to you or put other issues ahead of environment on the agenda? The Nature Challenge is a set of simple, practical things that people can do to reduce their “ecological footprint”. It’s a set of behavioral changes that we can make to lessen the toll the environment takes as a result of us. David Suzuki thinks that if enough Canadians sign up for the Nature Challenge on his website then politicians won’t be able to argue that the environment isn’t a concern. His goal is to get 1 million Canadians to sign it. Considering that Comedian Rick Mercer got 1 million Canadians to petition Stockwell Day to change his first name to “Doris” then why can’t we rally as much support for something that’s slowly killing us all which might one day do so abruptly? I notice at about 4:57 that it had turned to a rather dismal, dreary day. I hadn't noticed before because my eyes were locked to my computer, making frustrated attempts to write cover letters as the frantic job search marches on. Then I went and stood outside. Since my morning jog when the snow was still slushy and there was that hope that perhaps the final nail had been driven into winter's coffin it started up again. The grey, remorseless sky, spitting out little pellets of ice, once again. The wind was moaning or at least I thought the wind was moaning but then I realized the sound was coming from next door. There is hardly ever a peep from next door in the little white house with a bird bath that is tipped over in the backyard. There lives a lone little old man who I can only detect by the small lamp that shines through the curtains. Once, when I was standing between our houses talking to my friend I looked up and was shocked. It was as if I were seeing a ghost: there stood old man Cedrick staring down at us through the window. 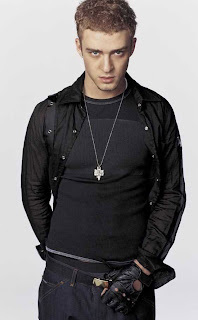 I immediately hushed and stood acutely aware of what seemed like an angry scowl on his face. Now that I look back on it, perhaps it was merely wrinkles. I am always afraid that old man Cedrick will be annoyed by me or my fellow neighbours. His driveway is grown over in the summer but he keeps a "Private Driveway" sign clearly posted. Sometimes we stay up late and play drums and blast our guitar amps to jam to the fullest. I can't be sure that volume doesn't upset him once in awhile. But today when I stood outside and looked through the barren tree's arms, I heard something that sounded suspiciously like a violin. The rising and descending scales of music coming from old man Cedrick's house. I could hear him playing "Ode to Joy". The former employee relies on Service Canada to get his (un)employment insurance since he can’t rely on the bosses who laid him off to continue paying him. They rely on him to get his Records of Employment (ROE) yet he has to rely on his old employers to send them in the mail. They have to rely on their Accountants to look up those Records of Employment and those Accountants have to be pretty damn sure they’ve collected the correct address from the former employee if the employee is ever going to get that record. After it has left their hands, they rely on Canada Post to deliver that ROE right to the former employee’s door unless, of course, the former employee has a patch of ice in front of their mailbox. Then the mailman will have to reach his arm across the patch of ice and drop a notice into the mailbox notifying the former employee that he is having trouble delivering his mail instead of delivering the mail itself. The former employee may then wonder how Postal services all over Canada function –even those in the Northwest Territories where there is bound to be ice just about anywhere. He may then conclude that of course they function yet he may still wonder why his Postal Service doesn’t. He will consider getting a truckload of sand and blanketing the city with it. He will hope that his cell phone reception is clear enough to reach the Postal Processing Plant directly although he can’t expect that the line will not be busy for hours on end or that he will actually be able to get through to them at all. He may simply have to go there in person to deliver his own mail. If he does get through to the plant the person on the other end may need to verify information that they cannot, at this time, verify since there are many different carriers and some have been injured on the job trying to deliver mail. If the former employee is starting to think that perhaps Canada Post might be a place that is in need of replacements for their employees since they are all apparently injuring themselves delivering mail (carriers can't always rely on their health) and even goes so far as verbally expressing it on the phone he can go ahead and apply online and the receptionist at the Postal Processing Plant would “encourage (him) very much to do so.” However, right now the former employee’s main concern is to get his mail and get his Empolyment Insurance since he’s had absolutely no money coming in for over a month. The former employee will then have to rely on the scant records that he does have and show them as proof of employment by traveling to an entirely different city to appeal to officials there. He will have to rely on the public transportation service to get him there but he doesn’t have a ticket. Once the claim is made and after 4-8 weeks of processing, it will be up to Service Canada to decide if indeed the former employee is eligible to reap the benefits that he has been paying into for the past ten years of his employment history. In the meantime, it’s not Service Canada’s responsibility to clothe or feed former employees (or have employees of Canada Post hanged) even if they have direct access to all of the information regarding their entire work history and employment. When secondary documents are shown THAT is their cue to start processing the claim. ...That would be the Jimmy Jazz, which is a dive bar in downtown Guelph. It is the place where I developed my performative qualities, having played open mic there now for almost two years. 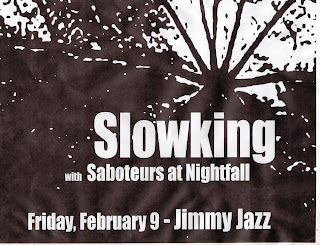 The Saboteurs at Nightfall (my drummer and I) will be opening for SlowKing, another band that originated in Guelph, tomorrow night. They are described as "sounding like Interpol with a hint of Joy Division". Since I enjoy both those bands, I shouldn't have any trouble melding in as their opener. I'm very excited about this show because I have three new songs to unveil with a faster, post-punk feel than my other songs. My drummer, whose influence has inspired a new phase of creation in my music composition, may or may not be accompanying me (we have certain logistical concerns to overcome) but nevertheless I will rock out just as hard regardless. If you're seeking a good sound for your soul, listen to your ears...Hope to see you there! The show was great. The crowd was great. There were all the right things in place. SlowKing, looking as dapper as ever in their dress shirts and ties brought with them lots of energy, some groupies and offered pins and prizes to active audience members. I chatted with their bassist, Anthony about the importance of a recording (something I know I need to do), getting a myspace with uploaded tunes. We found that many of our influences are similar so it was great to have the opportunity to play with them. We discussed the do's and don't's of good music performance and although they mostly practice in Toronto, they said there might be an opportunity to hang out and jam again. Although I was a little troubled by tuning issues during my set apparently no one else heard it and many gave me warm compliments on the vocals and lyrics of my songs. Since the response was good, I look forward to more shows in the future. I recently watched The Illusionist. Ever since, I've had a fascination with levitation, card tricks and suspension of gravity. Manipulating objects beyond comprehension and bending spoons back into shape, here is MadV displaying some mind-blowing skills.